Moving your website to a new domain is something no one wants to do willingly. After all, you stand a chance to lose the benefit of all the good SEO work you have done for the existing domain and website. But there are circumstances when you have to take the bitter pill in the wider interest of the business. It can be reasons like the change of the name of your company, or you might get a more user friendly domain name with .com which wasn't earlier available, you might consider consolidating multiple domains into one, there might be re-branding requirements and many other forecasted or immediate reasons for the same. But regardless of the reason for change, the big question remains - is it possible to migrate your domain and still retain the SEO value of your old site? The good news - yes, it is! In this blog we will discuss how you can migrate your WordPress Site to a new domain without losing SEO value. See Also: Move Your Free WordPress Site To a Self-Hosted Website in 5 Easy Steps! Though it might not be counted as an integral step for the migration, it counts as one of the best practices for site management. Backing up your site ensures that any loss of data during the process can be recovered later from your downloaded copy. Therefore, backup all the static files which include your WordPress files, theme files etc as well as the database. You can download the WordPress files manually through your FTP account and database from your server Cpanel using PHPMyAdmin. a) Login to your cPanel interface and select Backup from the dashboard. 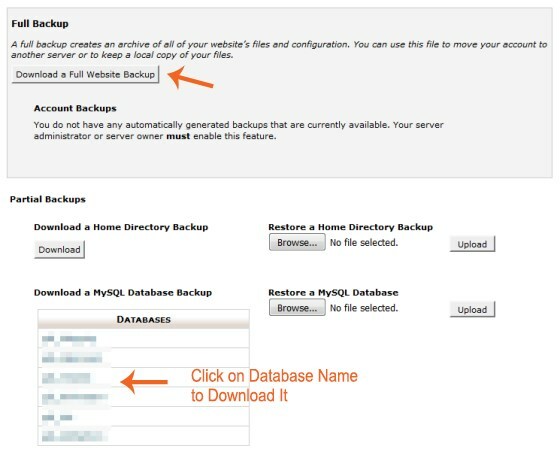 b) On the next screen choose either full site backup or individual database backup. a) Login to your cPanel interface and select phpMyAdmin from the dashboard. 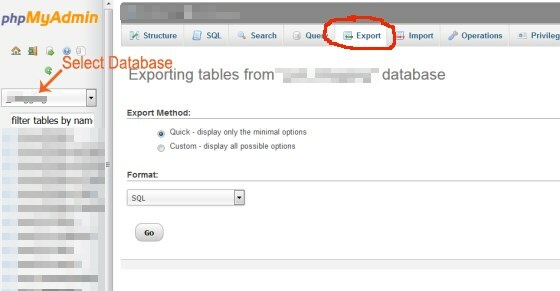 Login to your phpMyAdmin panel and choose the Export option. Download the backup in SQL (recommended) or other format of your choice. If you don't want to do these manually or find it too technical, you can use any suitable plugin for taking a backup. Verify your new domain with Google Webmaster Tools. If your new domain had been previously in use, it might have pending penalties. Check the manual actions page in the Google Webmaster Tools page and if you find no issues, carry on with the migration. If you find a manual action pending, get it solved before you take further steps. Once all the formalities are done, you get a green signal. Now, your new domain is ready go live! Looking for New Domain? If you are in search of registering a new domain name, you can try BlueHost that offers both domain name registration as well as hosting. The main task of migrating content from your old WordPress domain to the new one starts now. Though it is recommended to move them bit by bit to see how they are doing in terms of SEO, it might take a lot of time which can be difficult in most of the cases given the lack of time to experiment. Create a new database in your new domain. Upload all the WordPress files you had downloaded as backup to the new domain server through FTP. Download and use Filezilla for this. Change website url and home page url by editing the wp-options table in the new database. Now that the migration work is done, you need to secure your old site's SEO. You will need to go through a few steps to redirect your old urls to the new ones. Set up 301 redirects in your .htaccess file to ensure that your new visitors are redirected to the new site. This informs both the visitors and Google of your permanent change of web address. This is the most crucial step to keep your previous WordPress site's SEO value intact or you might be charged for plagiarism for having same content on both the sites. You will require mapping the old URLs with new URLs to keep the redirects organized and your visitors will get to see the most relevant content that matched their search. Don't do site wide redirect of your old urls to your new url home page. Inform Google about the migration and submit a sitemap to Google Webmaster Tools. This ensures that the search engines are informed about the content on your new site. Keep a check on the search engine results of your new site to ensure that your site is properly indexed. NOTE: If you have changed the URL Structure of the posts the above example code will not work. You are now done migrating all the content of your old site to your new domain without compromising the SEO of your previous site. Though it might seem to be a little tedious but it's definitely worth it if you don't want to start from the scratch, which might not be a smart idea if your previous site had good SEO rankings. However if you are not sure how to take care of all the above steps, just hire a competent WordPress developer who can help you with the migration process. Mr. Maulik Shah is the founder & CEO of Biztech IT Consultancy Pvt Ltd. , one of the leading web design and Development Companies in India. He also runs Biztech Blog, where he shares insights from the world of ecommerce and other web based technologies.